I managed to sneak out to the Fredricksted pier last night for a night dive with Kristen and two guests. While I used to guide them a lot, Captains duties seem to get in the way too often now. It felt really good to get wet in the dark again. I am still amazed at all the cool things living under da pier! Checked out a pod of squids doing the night dance, several small octopus, Sea horses, a jelly fish displaying some really cool bioluminescence and little decorator crabs hanging out on tube sponges all in the 15 minutes. On one of the rubble piles, what I thought was a boulder turned out to be a huge hawksbill turtle napping. This guy was big, prolly 5 ft long with a head the size of a fence post! We came across a 3 ft spotted Eel looking for a meal, along with two nice sized decorator crabs, one red and one yellow, battling it out for a preferred nighttime spot in the rubble. We found a Green Moray hiding under some rocks, poking his softball sized head out to see what was going on. Looking up and out to the south side of the pier large schools of small bait fish danced in my light while trying to avoid being an appetizer for the four Tarpon following them. 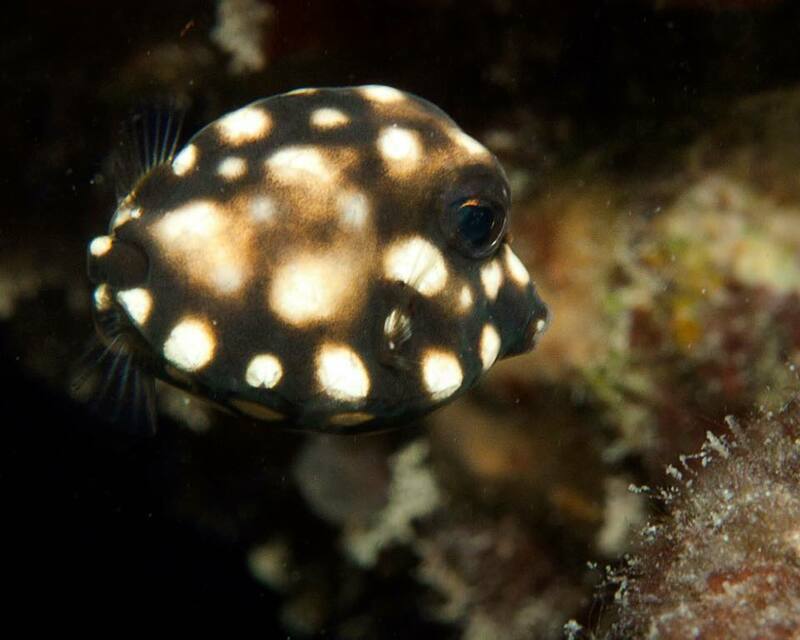 Last but not least, a juvenile trunkfish was spotted trying to hide in the sponges on on of the pillars. 76 mins later we reached the end of the pier and admired all the shrimp, lobster and crabs playing in the rocks as well as one more octopus cruising along the bottom. Night time on the F'sted pier, still a fantastic, amazing dive.